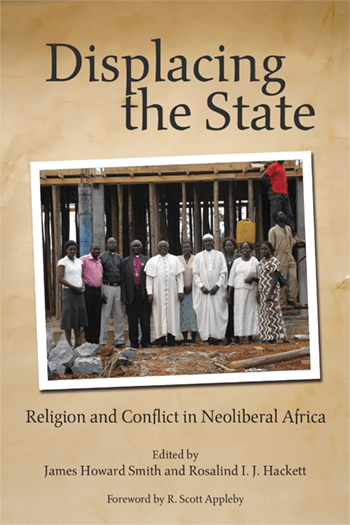 This month, University of Notre Dame Press publishes Displacing the State: Religion and Conflict in Neoliberal Africa. Edited by James Howard Smith of U.C. Davis and Rosalind I.J. Hackett, Professor of Religious Studies at the University of Tennessee, Knoxville, Displacing the State collects essays exploring religion’s role in African colonialism. It also collects essays exploring the ways in which religion shaped post-colonial African politics and continues to shape politics in present-day Africa. For the publisher’s description, please follow the jump. Notre Dame Press excerpts James Howard Smith’s introduction to the volume here. In colonial Africa, Christianity has often supported, sustained, and legitimated a violent process of governance. More recently, however, following decades of violence and oppression, churches and religious organizations have mobilized African publics against corrupt and abusive regimes and facilitated new forms of reconciliation and cooperation. It is the purpose of Displacing the State: Religion and Conflict in Neoliberal Africa to illustrate the nature of religion’s ambivalent power in Africa while suggesting new directions in the study of religion, conflict, and peace studies, with a specific focus on sub-Saharan Africa. As the editors make clear, most of the literature on conflict and peacebuilding in Africa has been concerned with dramatic conflicts such as genocide and war. In these studies, “conflict” usually means a violent clash between parties with opposing interests, while “peace” implies reconciliation and cooperation between these parties, usually with a view to achieving a social order predicated on the idea of the sovereign national state whose hegemony is viewed as normative. The contributors argue that this perspective is inadequate for understanding the nature, depth, and persistence of conflict in Africa. In contrast, the chapters in this volume adopt an ethnographic approach, often focusing on mundane manifestations of both conflict and peace, and in so doing draw attention to the ambiguities and ambivalences of conflict and peace in everyday life. The volume therefore focuses our attention on the extent to which everyday conflict contributes to subsequently larger and more highly visible clashes. Displacing the State makes two important contributions to the study of religion, conflict, and peacebuilding. First, it shows how peace is conceptualized and negotiated in daily life, often in ways that are counterintuitive and anything but peaceful. Second, the volume uses African case studies to confront assumptions about the nature of the relationships among religion, conflict, and peace.